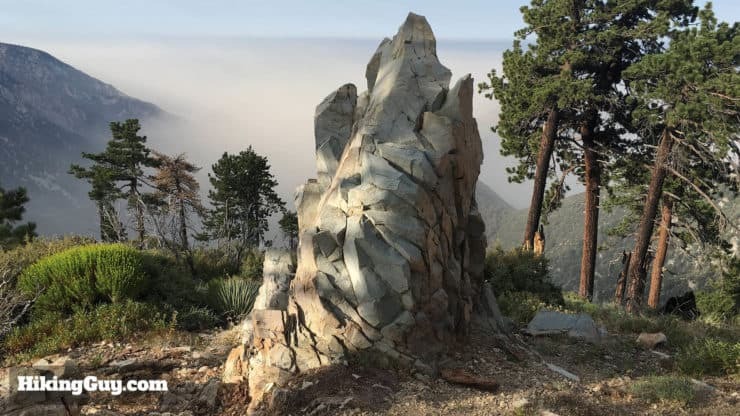 The Bear Canyon Trail, built in 1889, used to be the main route to hike Mt Baldy, which is why they call it the Old Baldy Trail. 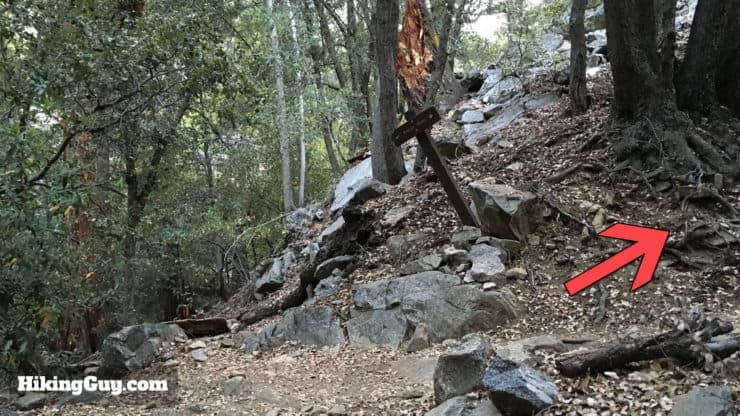 When the road to Manker Flat was built in 1936, the shorter Ski Hut and Devil’s Backbone routes became more popular. 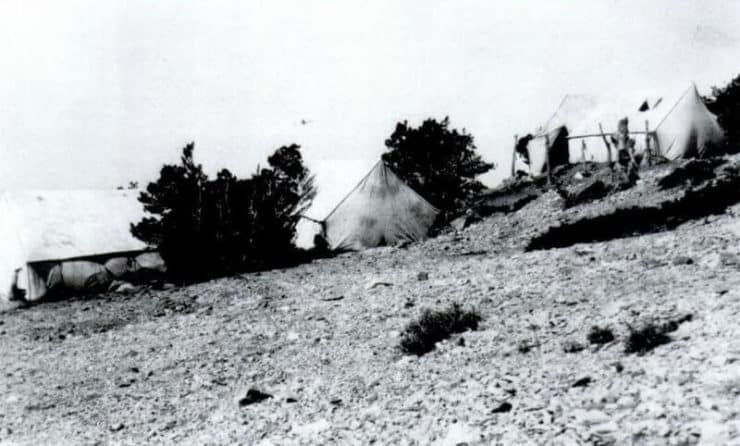 Bear Canyon was also the main way to access the Baldy Summit Inn, opened in 1910 by William B. Dewey, who was the first gringo to summit Mt Baldy in 1882. It cost $1 a night to stay at the inn, but burnt down in 1913. The Baldy Summit Inn, 80 yards below the summit. The tents were anchored down to withstand the high winds. 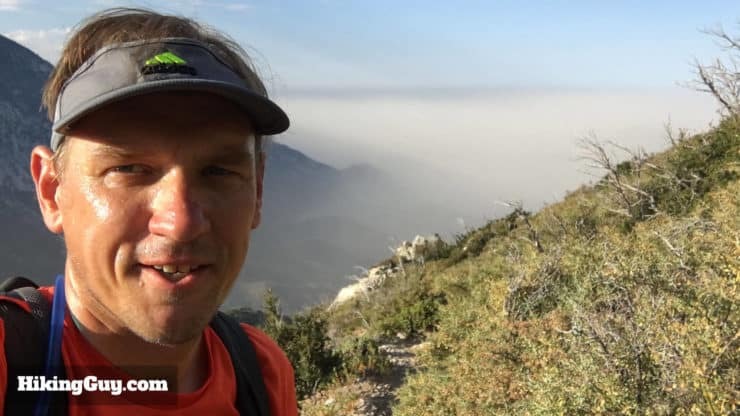 Use this as the trailhead address: 6778 Mt Baldy Rd, Mt Baldy, CA, 91759, USA. Parking here is tough. 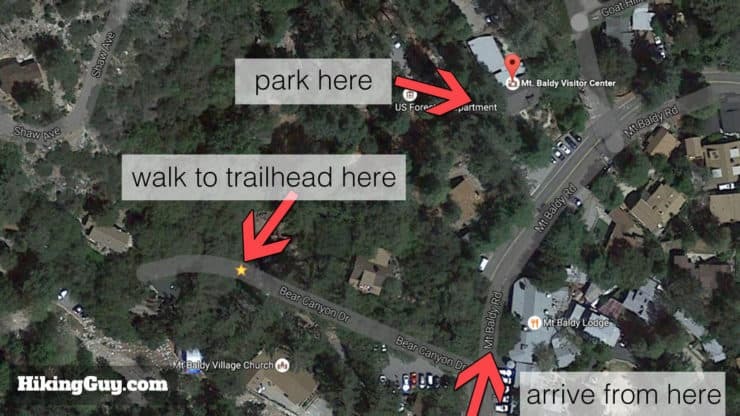 There are six spots in front of the Mt Baldy Visitor’s Center where you can park and leave your car. You can try your luck along the road in other places, but beware of the “no parking” signs. 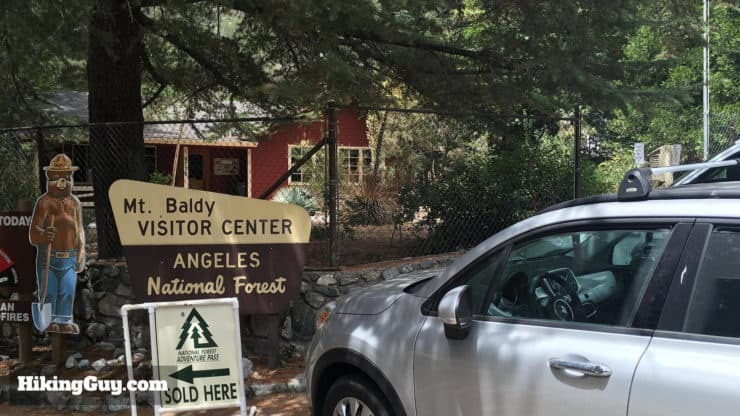 The Mt Baldy Visitor’s Center lot has a 20 minute maximum time. 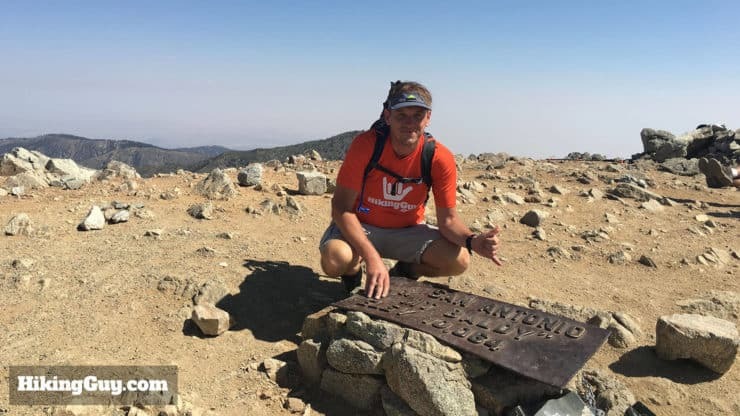 I would recommend calling the Mt Baldy Visitor’s Center number (above) to confirm. The parking situation seems to change every so often here. Park in front of the official Mt Baldy Visitor’s Center. 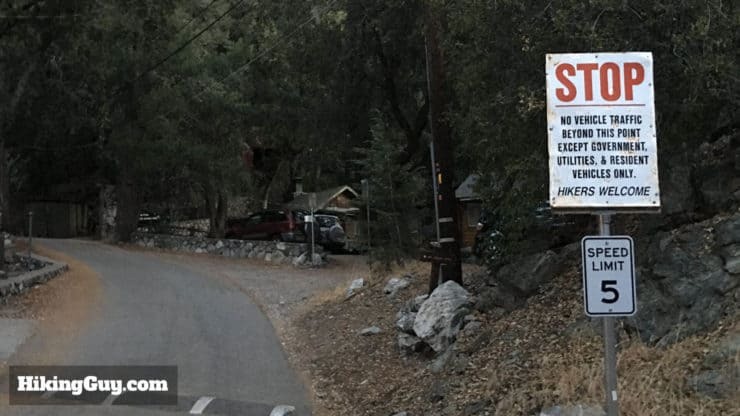 It’s right past Bear Canyon Road as you arrive in Mt Baldy Village. 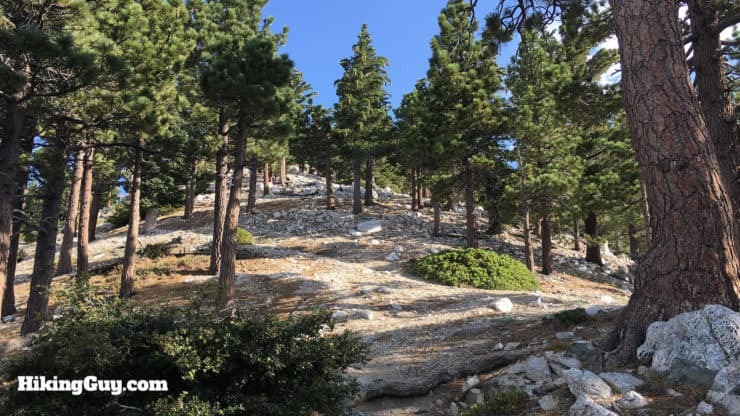 Once you’ve parked (and left your parking pass on the dashboard), walk back down the road to Bear Canyon Road, which is directly across the street from Mt Baldy Lodge. 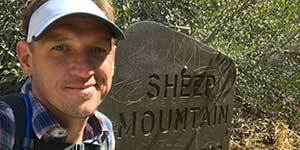 When I finished the hike from this trip report, I ran into some upset hikers. They had arrived before dawn, and the parking options and signs weren’t so obvious. 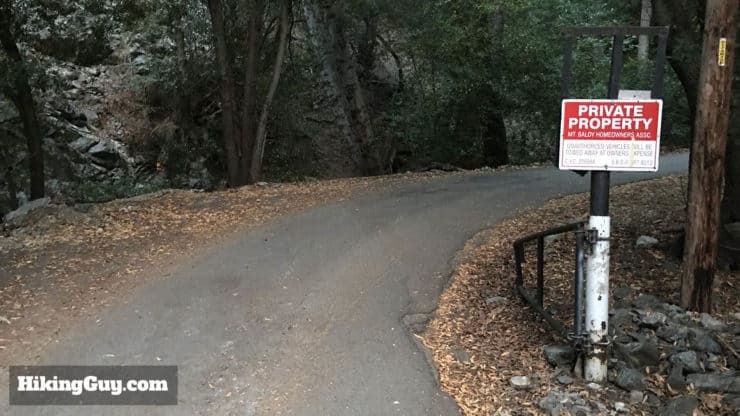 They saw a sign at the start of Bear Canyon Road that said “Private Road – Hikers Welcome” and assumed that meant they could park at the trailhead. 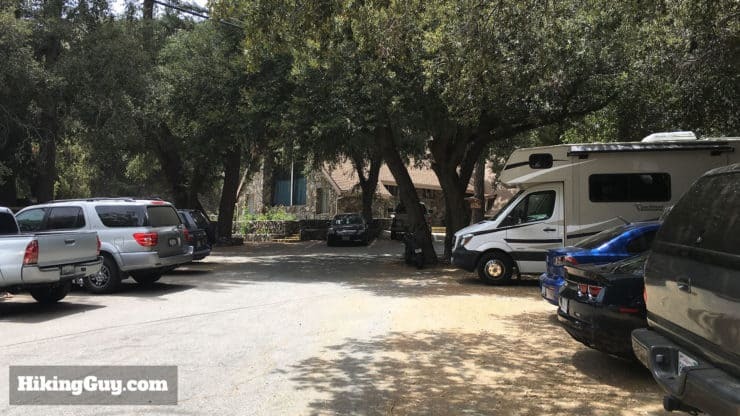 When they got back from their hike, a local (named “Mark” who lives on Bear Canyon Road) had left a really nasty and threatening note on their windshield. Yes, they made a mistake and parked in the wrong place. No, they didn’t deserve a profanity-laced missive on where to park. So take care when parking and avoid the grumpy locals. And stay classy Mark. 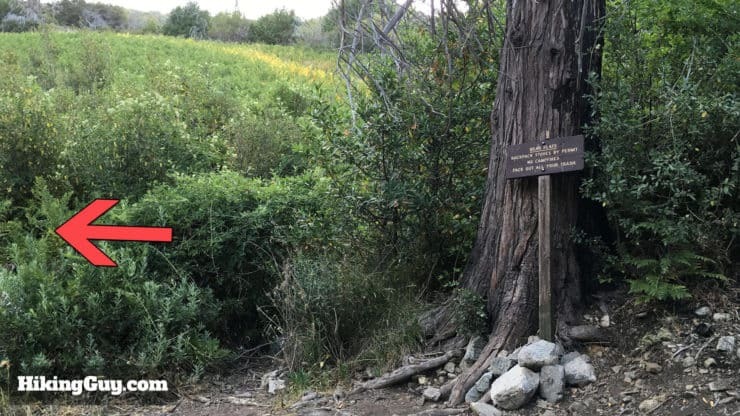 The sign that confused the hikers who parked incorrectly. 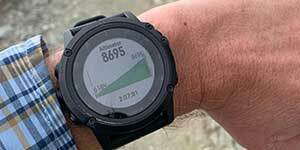 This is a tough backcountry hike and you need proper hiking gear. Bring at least 3L of water, food, and gear for changing conditions. 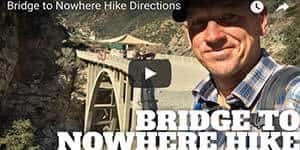 This is not a hike to do in bad or winter weather, unless you are very experienced in those conditions. 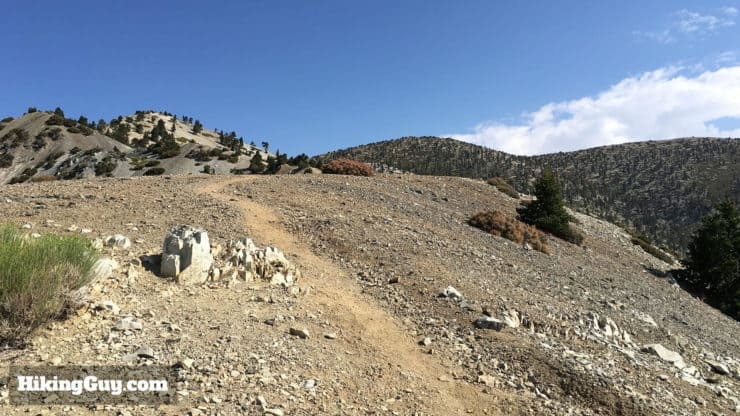 The Bear Canyon Trail is exposed for much of the way, with some sheer drop-offs on either side. People die here, don’t take any risks. The route up starts in Bear Canyon and then quickly goes uphill. 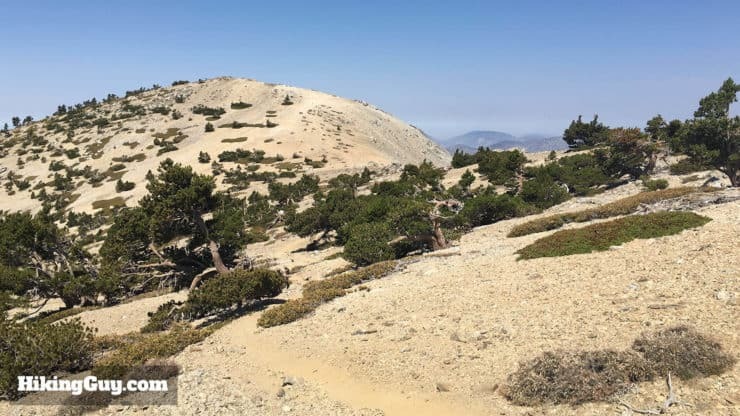 After the first half of the hike, you are exposed and above the tree line. 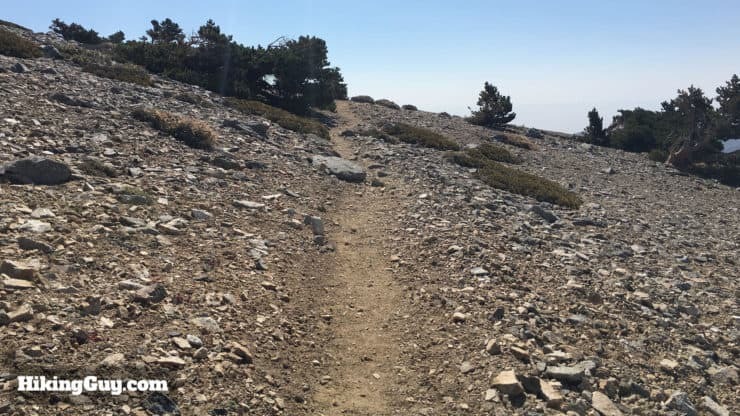 The last mile or so to Baldy is actually some of the easiest hiking. This hike is very steep. The hardest part is from mile 1 to mile 4, where the gradient is around a steady 18%. Unfortunately the steep slope makes the descent a little tricky too. I recommend using trekking poles on this hike. Here’s the sign for the Mt Baldy Visitor’s Center. 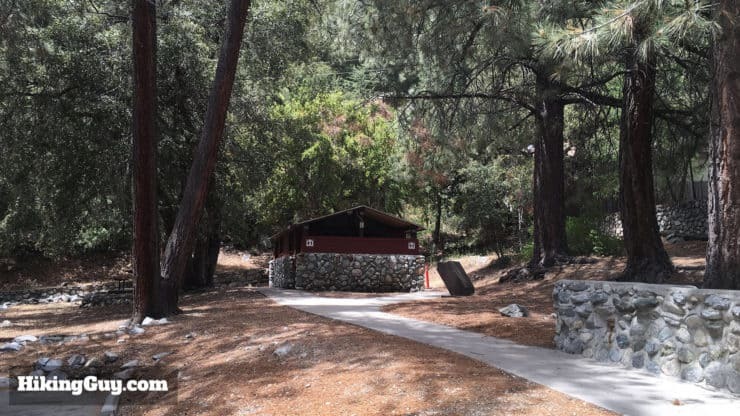 There are bathrooms in the lot at the Mt Baldy Visitor’s Center. 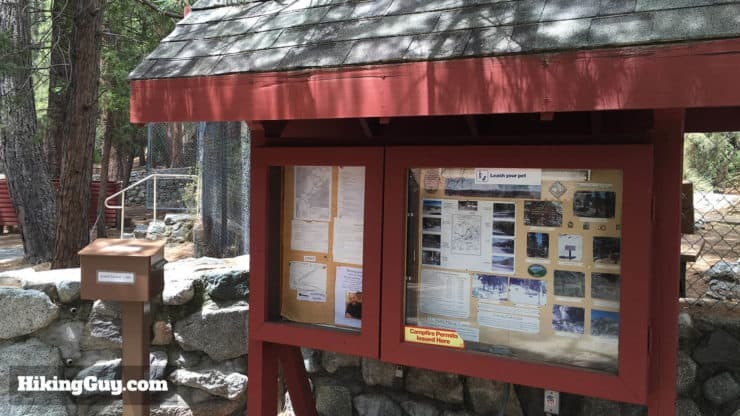 Check the hike board at the Mt Baldy Visitor’s Center for any information. You do not need a permit for this day hike, so don’t worry about permit box. Bear Canyon Road is where the hike starts. You’ll see the church behind the lot. Bear Canyon Road is through the lot to the right. Head up the paved Bear Canyon Road. The property on either side of the road is private, so please respect it. You are allowed to hike on the road. Shortly you’ll see a trailhead ‘no campfires’ sign on the right. 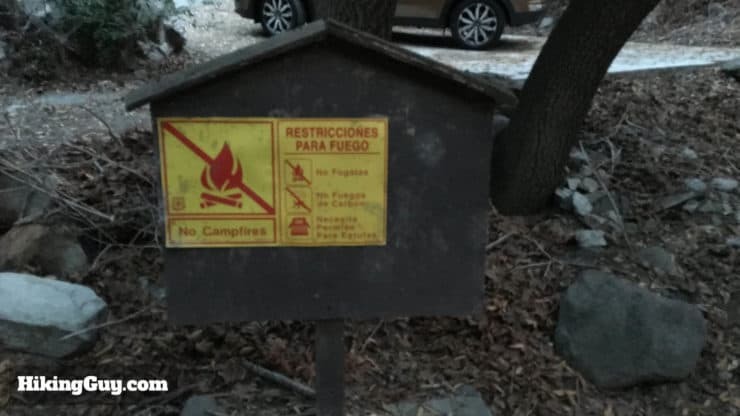 Next to that “no campfires” sign is the trail register. Sign if you want to. 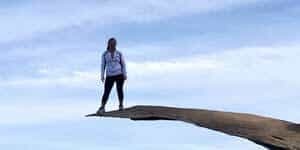 Again, no permit is needed for this hike, fyi. Keep hiking up Bear Canyon Road. Eventually it turns into a dirt trail. 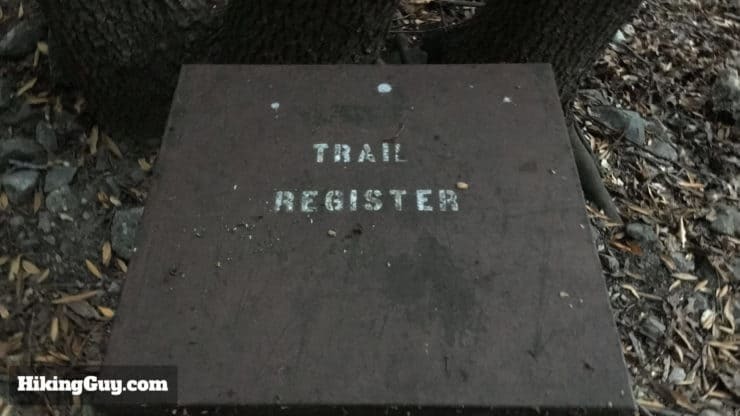 Shortly after Bear Canyon turns into a trail, you come to a trail sign. 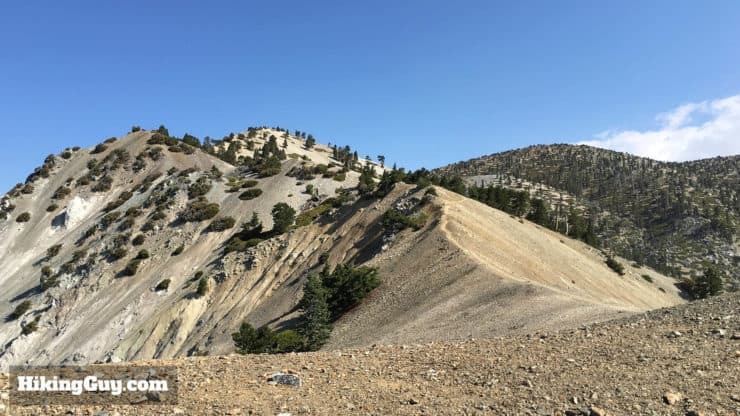 Hike right here toward Bear Flat and Mt Baldy. The Bear Canyon trail starts to head uphill. There’s another small sign marking the trail. Hike to the right and continue uphill. 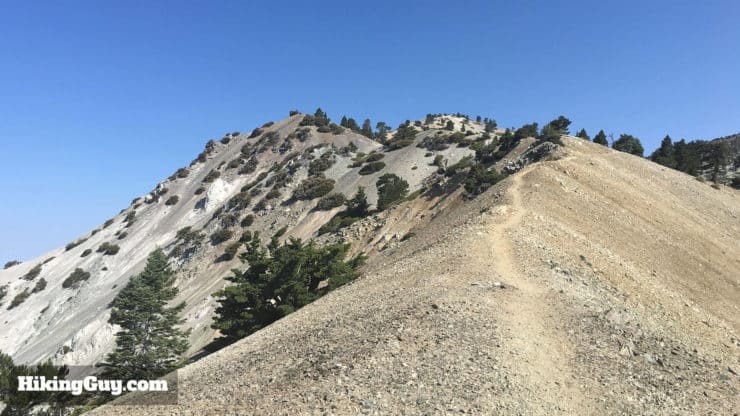 Eventually the trail opens up and you can see Mt Baldy Village below. 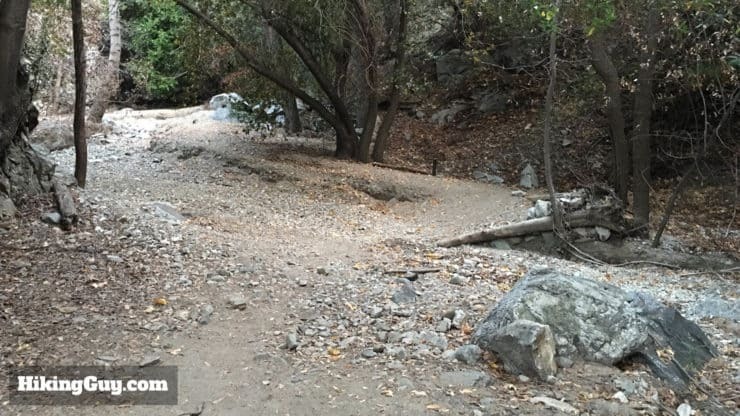 In about 1.5 miles you reach the Bear Flat campground. 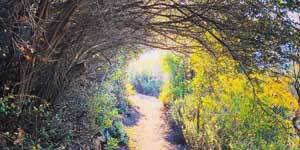 Hike to the left at the sign through the fern and manzanita covered meadow. Once through the meadow, the trail starts going up. Pace yourself and start climbing. It’s steep hiking here, with a gradient around 15%. Take your time. 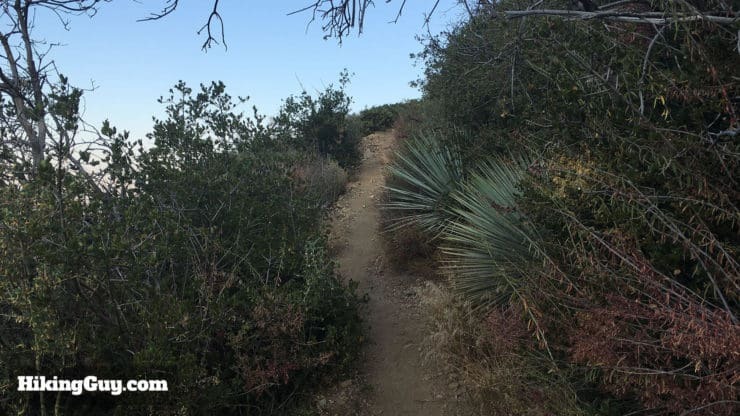 The Bear Canyon trail is easy to follow, but not really wide. At a few points there are cut-offs and small splits. Stay on the trail that’s more worn and you’ll be fine. There are also some random blue blazes. 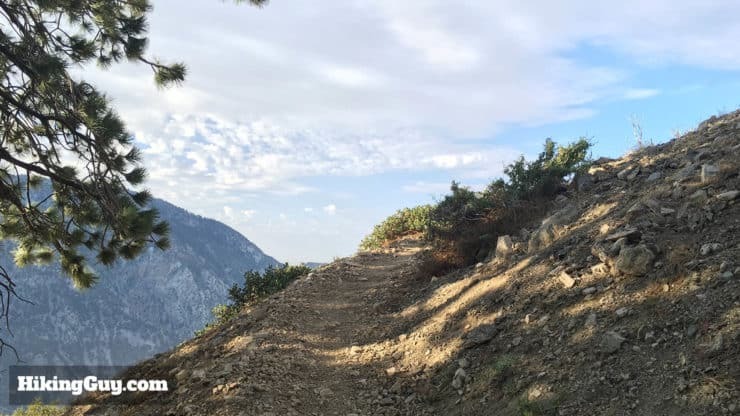 As the trail winds around the mountain, you’ll get views into the peaks around Mt Baldy. Most of the peaks you sea around you can be hiked. The Three Tees are directly to the right of Baldy. And across the valley are Bighorn and Ontario Peaks. All great hikes without big crowds. 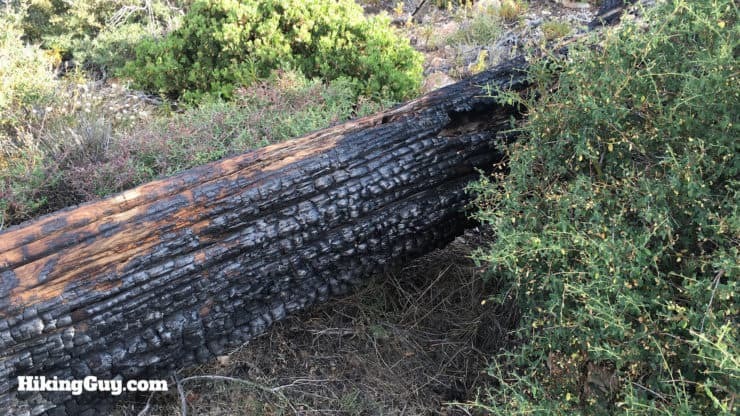 This section of the trail has some remnants of the 2008 Big Horn Fire. There are also some awesome boulders as the trail gets rockier. Eventually the trees turn into tall conifers, and the trail gets very steep. One last very steep section of trail before the tree line ends. After mile 4 the grade goes from extreme to hard. You’ll appreciate that when you get there. You emerge at the notch of the mountain. The landscape is barren and exposed. And beautiful. Below you can see 3000 feet down into Cattle Canyon. It’s truly breathtaking. 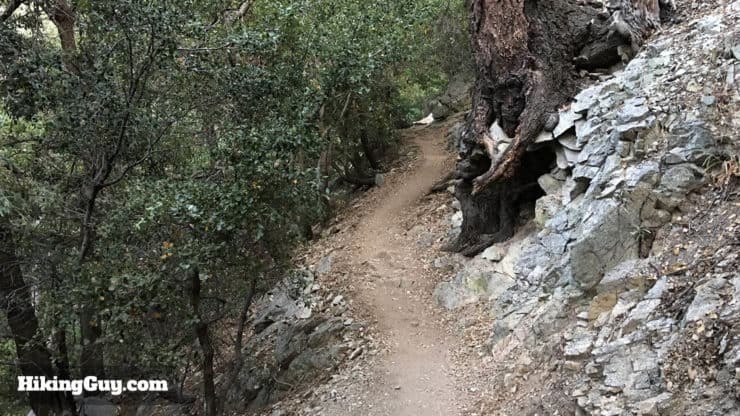 There’s a narrow section with sheer drops on either side, similar to the Devil’s Backbone on the route from Baldy Notch. This section is called “The Narrows.” Watch your footing and stay low if it’s windy. Here’s another shot of “The Narrows” just because it’s so cool. Once at this section you’ll be able to see Mt Baldy in the distance. You’re at about 9,200 feet at this point. After crossing that ridge, there’s a downhill section through some trees. The trail splits and reforms back together here. Again, follow the trail most trodden and you should be fine. Another narrow section of trail across a rocky slope. Almost there. You’ll start to see Mt Baldy in the distance. Continue on the Bear Canyon Trail. 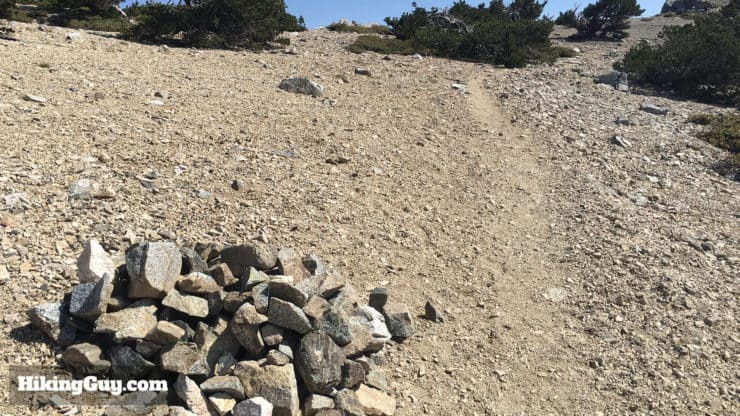 There’s a pile of stones marking a side trail to the right to West Baldy. 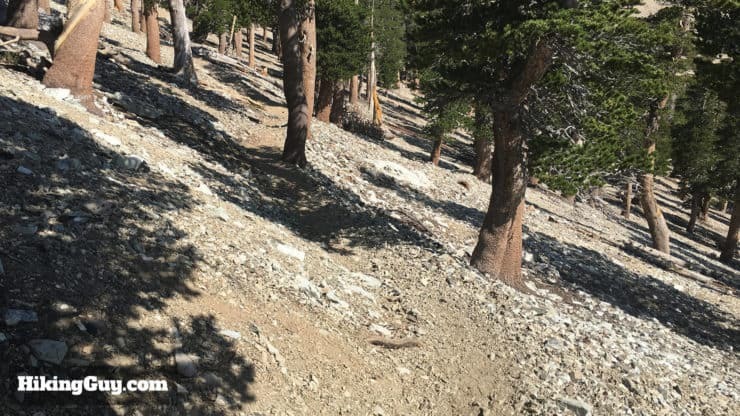 The West Baldy spur trail is barely visible. 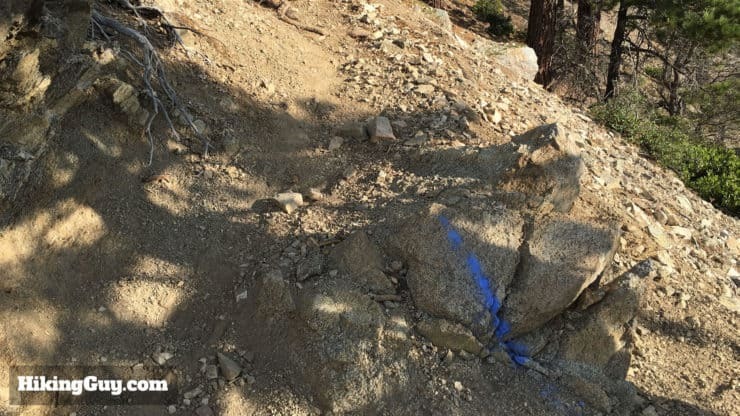 Stay straight on the Bear Canyon Trail. 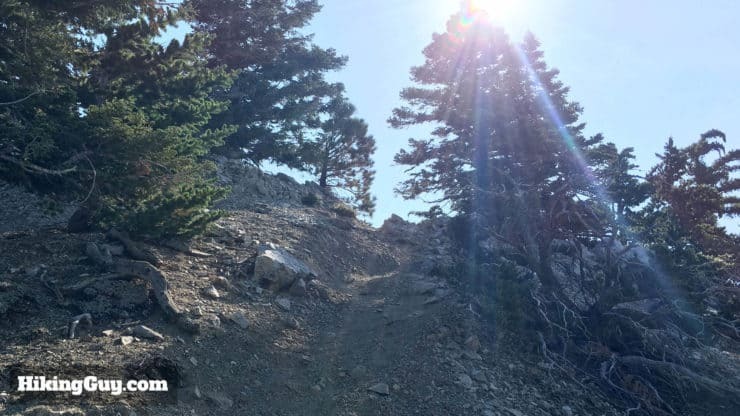 One last section of climbing before you reach the Mt Baldy summit. Mt Baldy! You made it. There will probably be crowds up here from the more popular routes. 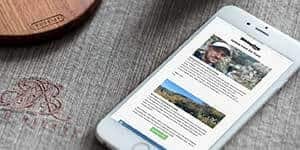 Grab your pictures, eat a snack, and continue back down the way you came up. 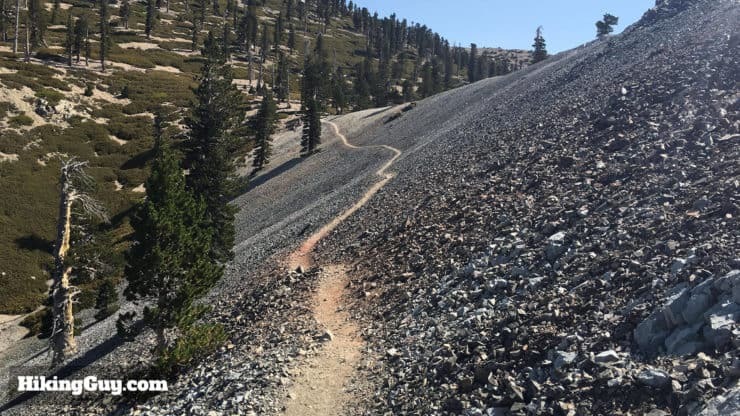 When you first get back on the trail, make sure you don’t take the turn down the Ski Hut Trail. It’s easy to follow the crowds down that route sometimes. 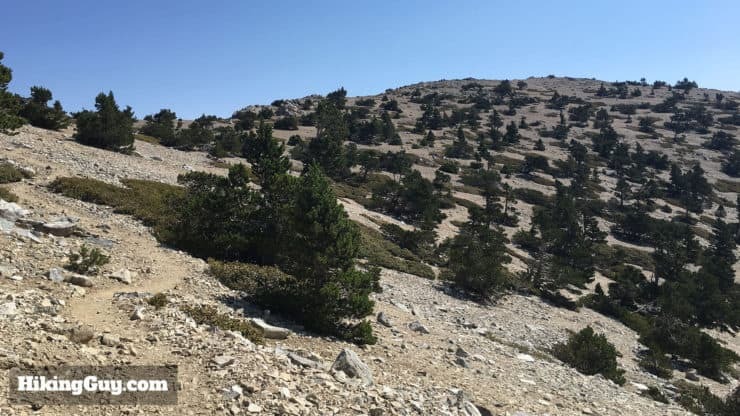 Take care on the descent, the trail is steep and it’s easy to loose your footing. 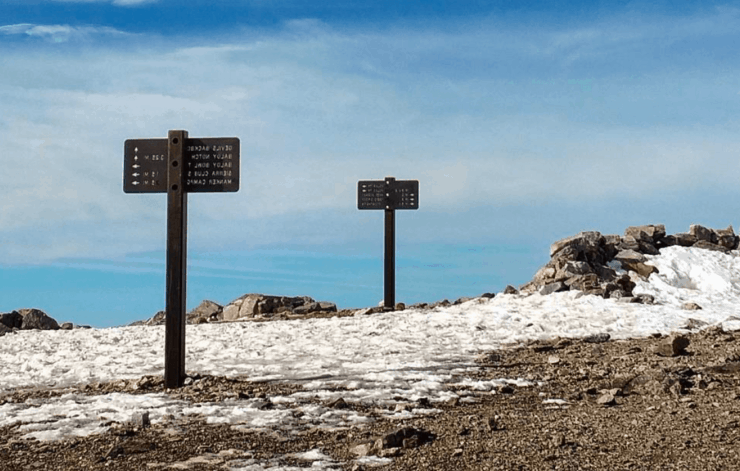 UPDATE: Evidently there are new signs on the summit that point you in the right direction when you head back. The trails up here can be confusing, so this is a welcome addition. 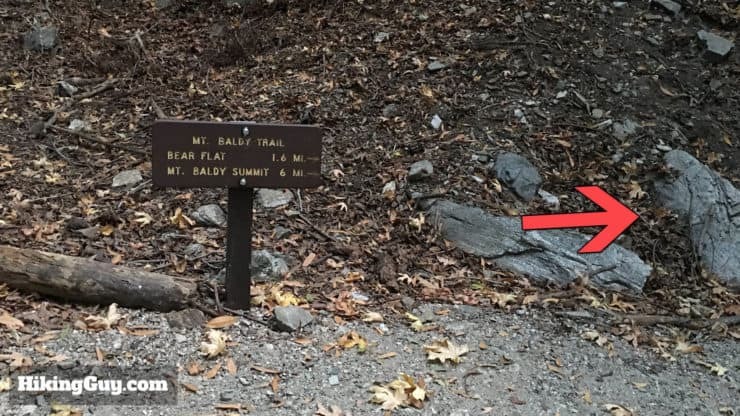 However signs don’t have a good track record on Mt Baldy, with many being stolen over the years. Just a heads up. 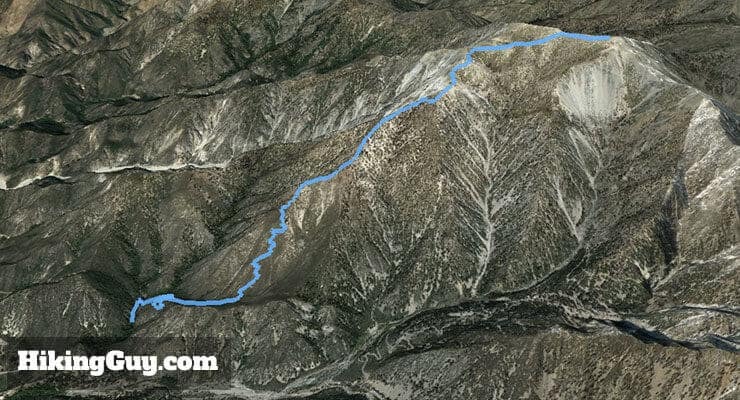 When you first head back, look for the trail to the right of Bear Canyon Trail to do a short side trip to West Baldy. 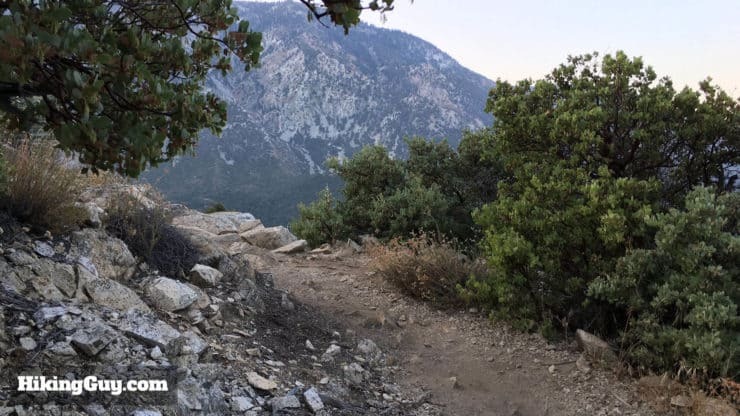 Once you’re on West Baldy, just hike back down to the Bear Canyon Trail and continue your descent. This side trip is optional. Sometimes I’m so tired at this point, my sole focus is returning to my car and getting a cheeseburger.